TL:DR Saint Patrick’s day is March 17th. Get ready for the special day by creating ads that will bring awareness to your brand and improve sales on the festive day. Saint Patrick’s Day is a cultural and religious celebration of the death of Saint Patrick, Ireland’s Patron saint. In many countries, not just in Ireland, it is a day to wear green, and drink and be merry with friends. It flies under the radar - Not every brand will be paying attention to this festival, but if a country such as Ireland, the US or the UK celebrates the holiday, then run campaigns. You will be able to capture the attention of consumers that have historically not purchased or engaged with you in the past. This is because there will be less competition. You will also be able to save some money because you will spend less on ads due to a lack of competition. It should be noted that even countries like the Czech Republic will have a small but impactful community of people who also celebrate the day. Take time to do your research and reach these niche groups. Offer something St. Patrick’s day specific. Do you have products that can be customized for the day - turned green, have four leaf clovers on them? Then use them. Get your target audience involved. Get them to respond to your CTAs on the day. They can send pictures of themselves enjoying the day with your product. The best pictures win. This taxi share company knows their audience. A few soon to be clients might not be able to drive responsibly, thanks to the cheer from the day. A well-positioned themed ad will grab attention and is relatable to clients. Here, Krispy Kreme made their original glazed donuts green for the holiday. It’s a small change that would have required some food coloring but it gets people’s attention. Some people who might not have thought of having a donut on the day might stop simply for the novelty of eating a green donut. 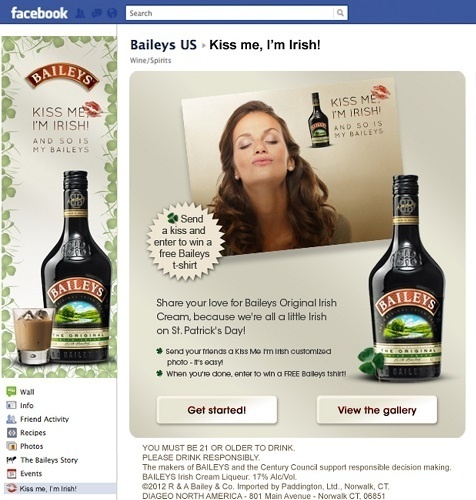 Another stroke of genius came from Bailey’s when they decided to encourage their followers to join the fun. They did this by having their customers take a picture proclaiming their love for Saint Patrick’s day with a “Kiss Me I’m Irish” caption. A lucky winner would win a shirt from Bailey with the same caption. It is a way to drive customer awareness and engagement. Saint Patrick’s day may not be for everyone, but where possible, it can a lighthearted way to raise awareness for your brand and acquire new clients that you might not have otherwise done by not creating a campaign for the day. You will be able to capture the attention of consumers that have historically not purchased or engaged with you in the past. Get them to respond to your CTAs on the day. Marketing 9 minute read How to Optimize Your Product Feed for Facebook Marketing 6 minute read How ROI Hunter is Getting Ready for the GDPR Marketing 6 minute read How to Get Even 5x more from Remarketing on Facebook!